Yesterday, I wrote an article about choosing a jewelry box. Today, I decided to go to ebay and see what people are selling. I found a few items that fits the criteria of a good jewelry box, well. at least from what i can see in the pictures. I just want to share to you some things I found. If you are interested in these, just click on the pictures, it will lead you to their ebay pages. On a related note, I have no relationship with the sellers of these items (I don't even know them) but I'm posting these items here purely for informational purposes. That said, let us go on to the jewelry boxes! The first jewelry box that caught my attention in ebay is this beauty (see picture below). From what I can decern from the pictures, the inner lining is good (felt-like or velvet linning are good), and the materials seems to be sturdy enough. I love how this jewelry case has a mirror in it. A very useful feature indeed! Because it is made of leather (according to the ad), it should feel more expensive than and solidly built. I am really considering this item, or something similar. I think this jewelry case is good for takeing with you as a travel case for your jewelry items. It has more of a lugguage feel than a jewelry case design-wise, but its functionality is promising for everyday use as well. If you preffer a diffrent color, there is also a white version of the case. The next case we will look at is a wooden jewelry box. This case really looks nice. It has compartments and three drawers. Functionally, it seems to be very well designed based on the pictures. It is made of wood and also has a mirror. Unlike the first jewelry box, this one is not designed to be a travel jewelry case, but I think this is more siutable for everyday use as your main jewelry box at the dresser. Something they are selling a lot on ebay is the bone carved jewelry box. 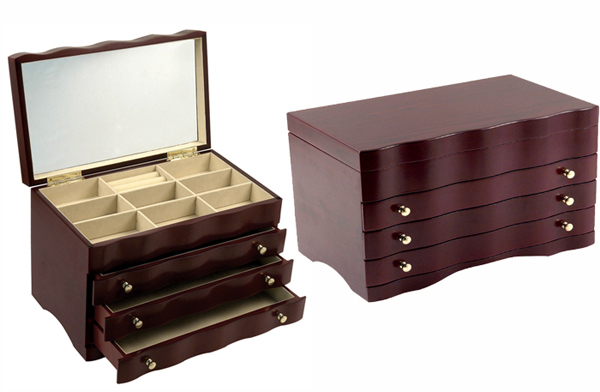 According to our criteria of choosing a good jewelry box, we montioned that cases that let air in is not siutable for all types of jewelry. However, you don't get these jewelry boxes for everyday use. In my opinion, these bone sculpted boxes are something that you buy purely for easthetic purposes rather than fuctional ones. They are very beautiful indeed, and a work of art in itself. You may get away with keeping tarnish free jewelry in these boxes but if you plan to keep things that oxidize quickly such as silver, in these jewelry boxes, you better place then in ziplock bags first. Well, thats it folks! I hope you have a good day. As for me, I'm going to head back to ebay and see what else is out there!